Bionomic Industries, Inc., a leading manufacturer of scrubbing equipment and "prepackaged" scrubber systems, has recently completed successful start-up and testing of their patented RotaBed® Scrubber in an SO2 scrubbing application at Fort James Paper in Camus, WA. According to mill personel, the Rotabed Scrubber achieved non-detect levels of SO2 at the scrubber outlet using magnesium hydroxide as the scrubbing medium. 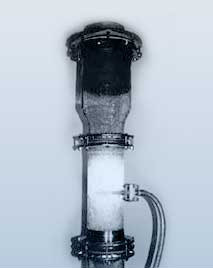 Rotabed's breakthrough design combines a stabilized Coriolis-induced, swirling fluidized bed of scrubbing liquid and "packless" plug-resistant grid cross section that is 99% open to deliver exceptionally high throughout capacity (4-6 times greater than packed tower or tray scrubbers) that results in the maximum scrubbing efficiency. Unlike fluidized-bed scrubbers that randomly "boil" or ebulate causing momentary inconsistencies in the fluidized bed, Rotabed uses the induced rotation to stabilize the fluidized zone and achieve superior mass transfer. The scrubber has also been successful in controlling acrylic polymers, acrylic acids, hydrofluoric and hydrofluoric acids, chlorine dioxide along with particulate over 10 microns in diameter.